Zvezda has followed its KV-1 Model 1940 kit (No. 3624) with the KV-2 heavy tank version using the production turret design. This was developed during 1939 as a “bunker buster” to deal with Finnish engineer works along the “Mannerheim Line” during the “Winter War.” After 24 KV s Bol’shoy Bashnoy (KV “Big Turret”) tanks were built in 1940, a new turret was introduced and another 191 tanks were built as the KV-2. But they overloaded the already stressed KV chassis, and most of them failed in action before they got into combat. Only one tank still exists in Moscow (a later production hull with a KV-2 turret on it) and apparently a second vehicle has now been put on display in Nizhniy Tagil with a new construction replica turret on a recovered KV-1 hull. The KV-2 mounted a 152mm M-10 howitzer in its naval-like turret with a 7.62mm DT machine gun in the hull and a second DT coaxial in a ball mount on the rear turret plate. At point blank range the gun was devastating to any fixed structure or tank, but it was very clumsy and difficult to maneuver in a swirling combat situation. Zvezda is an improving company and is now starting to produce world-class kits like their T-90A kit, but this one was designed just prior to that level of achievement. This kit is one of their nicer ones and has some really good touches, such as a partial interior and a choice between vinyl and “link and length” styrene tracks. The vinyl tracks in Zvezda kits, however, tend to be tauter than bowstrings so this latter feature is most welcome. The kit is based on their Model 1940/1941 kits but has a new set of 78 parts on two sprues for the turret. Surprisingly the turret is a “flat” molding in that it consists of six main parts (top, bottom, sides, front and back) with details added on. The M-10 gun is nicely done but comes with the odd three-section barrel that has puzzled many Russian modelers. The consensus opinion is that the three sections were actually shrouds for the gun barrel and were not present on all tanks, so some vehicles appear to have it and others do not. The gun does come with the basic elevation and cradle mechanisms, but other than the mount for the coaxial gun there is nothing inside the turret. 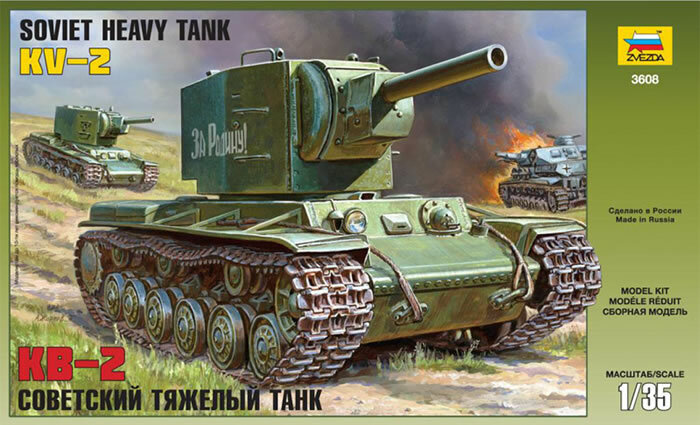 Those modelers who read Russian or have been fortunate enough to either get a copy of the book “Tyazhelyy Tank KV-2: ‘Neuayazvimyy’ Koloss Stalina” (KV-2 Heavy Tank: Stalin’s ‘Invulnerable’ Colossus) by Maksim Kolomiyets (Yauza/EhKSMO Publishing, Moscow 2001, ISBN 978-5-699-50462-6) will note it comes with interior photos of the preserved tank in Moscow as well as a copy of the factory blueprints from November 1940 that cover the interior. This makes adding an interior to the tank a much easier task. The kit also provides three early-style “ZIP” bins for tools and equipment. The model, however, is not without quirks and one major issue – according to checks with dimensions and plans published by some of the better Russian authors (Kolomiyets being the best “single source”) the model is about 3mm too short. Width, height and all major components scale out right, but then there are some “please don’t look too close” items. As before this model comes with the reinforced cast internally buffered road wheels, which were only used after mid 1941. But in the case of this tank as a good number were built in that time frame it is not wrong as it was with the Model 1940 kit. Overall, if you can live with the slightly short hull this is a nice kit and a good place to start due to the turret construction to build a KV-2 with a full turret interior. But for a better hull for the purist you may wish to “cross kit” with a KV-2 hull from Trumpeter.